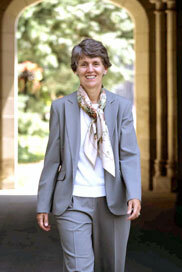 Catharine “Cappy” Hill ’76 will be the 17th President of Williams College. You read it here first. We need (or, the powers on the search committee will argue that we need) a quick hire, known to Williams, comfortable with our culture, and experienced with both leadership and hard economic choices. Cappy Hill fits those criteria perfectly. Quick Hire: The financial crisis makes this the most dangerous era for Williams in a generation. We need new leadership and we need it now. Although it would be nice to conduct a nationwide search lasting a year or more, perhaps installing an interim President like Carl Vogt ’58 in 1999-2000, the College lacks the luxury of time. Hard choices must be made and the earlier they are made, the less damage to Williams. Although Morty will serve as a good steward for the next 9 months, he is in no position to demand sacrifices from various stakeholders nor to make promises as to future benefits. He is a lame duck, with at least one eye focused on his responsibilities at Northwestern. So, Greg Avis ’80 (chair of the executive board of the Trustees and of the Presidential Search Committee) will want to have the job filled no later than this summer. That means a fast search, with a preference for those candidates that Williams knows well already. Known: Members of the search committee will know Cappy as well as they know virtually any other candidate. She is a Williams alum, a former faculty member and senior administrator. She was a finalist for the presidential search in 1999 that selected Morty. She is a known quantity. Select Cappy and there will be no surprises. The biggest mistake made by the Trustees in the last 20 years was the selection of Hank Payne. They won’t make an error like that again. Comfortable: Cappy is as comfortable with the Williams ethos as anyone can be. One son is an alumnus and another is a current student! She knows what makes Williams tick, what makes it special. She bleeds purple. And she is a golfer! The greens of Taconic are calling . . . Leadership: If you had to design the perfect President to lead Williams through a period of economic turmoil and difficult spending cuts, you would have two conflicting goals. First, you would want someone who knew Williams inside and out, who had served as Provost (more or less the chief financial officer of Williams) for many years. Second, you would want someone with experience outside of Williams, ideally someone who had already served as a college president, someone who has insider knowledge of how another elite liberal arts college prioritized its spending, ideally a less-rich college than Williams, a place that spent fewer dollars while providing the same quality education. Unfortunately, those two qualifications are almost never found together in one person, unless that person is named Cappy Hill. 1) Williams would not steal Cappy away from Vassar. Hah! Williams stole both John Chandler and Hank Payne from Hamilton without hesitation, after only 5 years in office. Indeed, Cappy is following precisely Chandler’s path of faculty member, department chair, senior administrator and then a different college presidency for seasoning. If Williams was willing to steal Chandler and Payne, we will steal Cappy. Her short tenure (3 years as of this summer) will make Greg Avis ’80 feel guilty, but only a little. His responsibility is to Williams. 2) Williams passed over Cappy once and will do so again. Perhaps. There was something that made Williams choose Morty over Cappy and maybe that something will happen again. But I doubt it. Being runner-up to Morty is still a good showing and her winning the Vassar job means that there was nothing substantively wrong with her application. 3) Williams may want Cappy but she will turn us down. Perhaps. Chair of the Vassar Board of Trustees William Plapinger should be a nervous man. He led the search committee that selected Cappy. He would hate to lose her. If he is smart, he is calling her right now, trying to (gently) pin her down on her future plans, double-checking that her committment to Vassar is as strong now as it was three years ago. He will not want to be so crass as to demand a promise from Cappy that she will remove herself from the Williams search, but he will strongly imply that it is unfair of her to expect him (and other senior trustees) to work hard on the current capital campaign unless she is fully committed to the future of Vassar. Luckily, Cappy is smart enough to put him off. 4) Cappy is a great candidate but there are a dozen others. True! There are many good candidates (and future posts will handicap the race) but none as perfect as Cappy. In fact, I can’t come up with anyone who comes close, at least according to the criteria I outline above. (Suggestions welcome!) She is an even money bet, at worst. Allow me to be the first to welcome her back to Williams. Well, I imagine she would be a good choice. The fact that Williams has never had a female Pres, and that she is an alum, can only help. But I think you slightly overestimate her chances of leaving. Two years on the job is a big difference from five years on the job, especially if they are, as you say, right in the middle of a capital campaign. She may not want to be seen as leaving the school in the lurch. And it’s not as if Williams is SUCH a huge step up from Vassar — the two schools are reasonably comparable in size and reputation. Plus, there is more upside to the Vassar job — Williams is already the top liberal arts school in the country, where can you go from here, while Vassar has a great tradition and history at the top of the LA pyramid, but perhaps is not as highly-regarded as it once was, so it’s a place a President can make a huge impact. Then again, a chance to lead her alma mater is so rare and unique that folks may be more understanding of her motives. I also note that according to her bio her husband heads a private school in NYC, which is significantly closer to Vassar than Williamstown. The paucity of comparable jobs in this area may also play a role in her decision, assuming she becomes the top choice. Oh, and one other thing — while the appeal of an economist is self-evident in tough economic climate, the faculty as a whole, even if they like Cappy, may not be thrilled with two straight econ profs (indeed, two straight profs who focus some of their research on the same area of econ) as President — there may be an internal desire for intellectual diversity / not to be seen as overly-econ focused. Now, a desire to be led by someone they know and trust may ultimately prove to be more powerful a sentiment, but that is something else to consider. Dave – I scooped you on this possibility days ago. But I agree with Jeff that there are drawbacks, even if she’d want the job. Two years on the job is a big difference from five years on the job. Chandler/Payne only had 4 years on the job at the point they were chosen. Cappy will have served three years by next summer. I believe that she and her husband have done the Williams/NYC dual career thing for many years. You overestimate how much sway the faculty has in this decision. Professors on the search committee will matter, of course, but you can be sure that Avis doesn’t want to have anyone who is anti-econ. To the extent that there is a contingent on the faculty that wants a non-economist as president (and I doubt that), they won’t have a meaningful impact on the search. And most of the faculty I know seemed to like Morty’s use of data and expertise on the topic. Again, in any search, there are a lot of moving parts and I don’t think that the odds for Cappy are any better than 50-50 right now. But they are certainly better than 1 in 5, and I can’t think of a different candidate with odds that good. We will know a lot more in a month, when a smart reporter for the Vassar student newspaper will ask Cappy about it. If she doesn’t remove herself from consideration, her odds go up to 75% or better. Also, I am not sure that Vassar is in a capital campaign right now. They either are or they are planning one. DK – It’s time for you to send an assignment to the Editor-in-Chief of the Vassar student newspaper, cc’ing the Record Editor-in-Chief and the Poughkeepsie local paper. Smoke that scoop right out. Good post. Great discussion. I think Jeffz identified the pivotal issues. Two years is a bare minimum. The change would lead undoubtedly to more separation in home life. Both excellent small LACs are roughly comparable, so its a bigger plus on the alma mater scale than as a career move. Beyond financial crisis managment, what opportunity exists to accomplish something great for Williams? Maybe she would have the vision of something great for Williams that has not yet occurred to the rest of us. On the other hand, even making Williams more uniformly great, strengthening places that aren’t what they could be (such as the technology issues others have raised), creating a lean and efficient management structure, improving student life, etc., etc. across the board could be a proud, wonderful and fitting legacy of the next President. It doesn’t have to be buildings or flashy things. Happy Vassar parent here… Putting aside questions of Cappy’s loyalty and commitment for the moment (although I hope they weigh heavily if she has an opportunity at Williams), I think of Vassar as a warm, calm, supportive environment without the intensity or nearly as many strivers as Williams seems to have. Vassar is a place that doesn’t seem to take itself too seriously… Mightn’t Cappy just plain be happy there? Larry, something great that escaped the collective wisdom of Ephblog? Could such a thing be possible :)? To address your point in another thread, I think we could have an interesting holiday break discussion, in a whole new post, about the ideal attributes / vision of a new President in the abstract, without naming any names whatsoever. If someone else doesn’t, I’ll start one of those in the next few days, and I’ll crystallize my own thoughts, already expressed in piecemeal fashion, on that topic there. lurkingmom – As you can see, we (as alumni) are proud of her and admire her. I view Vassar as fortunate to have Cappy in the presidency there, as any school would be. In looking at the Vassar website over the past two years to see how and what Cappy was doing, I have been struck to see that more “laid back” atmosphere you describe reflected in her announcements and other writings from the President’s office, and I’ve wondered to what extent it was the ethos of the school rubbing off on her. The irony for me is that, when one of my cousins went to Williams in the early ’60s and another to Williams, Vassar was very intense and serious, while Williams, by contrast, was rather laid back. They’ve reversed roles in a way. I could see how she would not want to leave. Loving Williams as many of us do, we tend to feel a strong pull toward the place and to overlook both the virtues of other places and the drawbacks and challenges to trying to return to Williamstown. Whatever happens with this (and I do think Cappy will be high on the list unless she removes her name), I hope it works well for all the institutions that may be involved. Re #10 – Jeff, I’d really like to see that. The only problem may be timing, as I would anticipate that traffic may be way down over Christmas week. On the other hand, if we can bump the thread up a few times, we might actually have students (gasp!) participate, as I seem to remember that they drop in more often than usual during Winter Study. There was a WSO thread on the topic, but it fizzled out pretty quickly after exams were done and students were traveling instead of procrastinating – you might check it before you write your post. Thanks in advance for doing this. I’ve undoubtedly said this elsewhere but I’d like for the new President to give the whole place a top-to-bottom review, eliminating inefficiencies and fixing nagging problems (but that would take a very skilled and patient people, as well as systems, person as there are lots of sacred beasts that would need to be slaughtered in the process). I’m not sure if that much has changed. I’ve definitely never thought of Williams as a place that takes itself too seriously. Williams certainly takes itself much less seriously than the vast majority of its academic peers (Amherst, Swarthmore, HYP, etc). What brand of gravit-o-meter are you using? Institutionally, Williams seems to take itself very seriously. I’m think of the layers and layers of committees dealing with something like student life or housing. At times, there almost seems to be a wall of bureaucracy that gives the administration and student government a very formal, officious air. hwc, I can think of a lot of ways to describe Williams. I could even find ways in which it might occasionally take itself too seriously, or more specifically, I might be inclined to say that some of it’s grads take themselves a bit too seriously, but not ever, in any way, from my first visit with my son, to the dealings I have had with the school since, would I describe Williams as having a “formal” and “officious” air. Larry, I’ll hold off on that thread until after New Year’s so that people will be more inclined to see it; the next two weeks everyone is on the road, good point. I think Williams does a lot of things, and has a lot of little traditional / campus flourishes, that undermine the idea that it takes itself too seriously. Starting with the campus itself, which is not a traditional brick / gothic quad-laden place that screams out to any passers by, look, this is place where serious thought happens. Rather than dripping with austerity, we have the eyes on Lawrence lawn, the ironic columns, Mission shaped like a (I formerly said eagle, now i say Rorschact test), perpetually purple Jessup, and other assorted goofiness. Our mascot is a puple cow (who is featured prominently on some admissions mailings). We have moutain day, and winter study, and the walk, and free university, and all-night trivia each semester right before finals for god’s sakes, and KAOS. Even the fonts and lists of facts and general tenor of admissions mailings give off a far more laid-back vibe than many competitors. All of those funky little Williams quirks undermine the notion that it is an overly-serious place. In fact, my sense from people like HWC was that the criticism of Williams from some quarters was that it didn’t take itself seriously enough — not enough students having deep intellectual / annoyingly pretentious (depending on how you look at it) conversations deep into the wee hours of evening, not enough students passionately engaged / being liberal posers (ditto) with off-campus social issues. All generously overladen with an ordinarily unspoken and invisible but omnipresent attitude of arrogance (except with respect to Harvard). I suspect it could very well be Robert Oden, president of Carleton College. Never underestimate the Fay Vincent connection. jeffz – Is Jessup really purple? I always thought it was more of a mauve. I see now that the story about a donor mandating that the building be painted purple, one that I repeated often as a tourguide, is in fact apocryphal. Oh well. I’ve never said anything even remotely resembling the words you attempt to put into my mouth above. Cappy would be an outstanding candidate but make no mistake, there is *a world* of difference between two years and four year on the job. To say the least, it would be extremely bad form to express an interest in leaving after only two years as a college or university pres. In higher ed time, that’s the corporate equivalent of four months. Yes, it does happen now and then. Most often, the pres is leaving a toxic situation of someone else’s creation—or the jump is truly meteoric. I think the pres of Iowa left for Cornell after a short tenure, probably doubling or even tripling his salary overnight–and he had some personal reasons for moving. My impression is that people feel more comfortable “jumping ship” if the originating institution is public and the reasons for departure can be attributed to politics, state budget cuts, or bad chemistry with the state coordinating board. In any case, I would not assume that there is only one eminently qualified “perfect” person to become the next president of Williams—or that only someone steeped in Williams is capable of leading Williams–or that the chair of the search would not shy away from “stealing” a president of a peer. EphBlog is powered by WordPress and delivered to you in 0.860 seconds using 41 queries..